Ennahda, the Islamic party in Tunisia, won 41% of the seats of the Tunisian constitutional assembly last month, causing consternation in the west. But Ennahda will not be an exception on the Arab scene. Last Friday the Islamic Justice and Development Party took the biggest share of the vote in Morocco and will lead the new coalition government for the first time in history. And tomorrow Egypt’s elections begin, with the Muslim Brotherhood predicted to become the largest party. There may be more to come. Should free and fair elections be held in Yemen, once the regime of Ali Abdullah Saleh falls, the Yemeni Congregation for Reform, also Islamic, will win by a significant majority. This pattern will repeat itself whenever the democratic process takes its course. In the west, this phenomenon has led to a debate about the “problem” of the rise of political Islam. In the Arab world, too, there has been mounting tension between Islamists and secularists, who feel anxious about Islamic groups. Many voices warn that the Arab spring will lead to an Islamic winter, and that the Islamists, though claiming to support democracy, will soon turn against it. In the west, stereotypical images that took root in the aftermath of 9/11 have come to the fore again. In the Arab world, a secular anti-democracy camp has emerged in both Tunisia and Egypt whose pretext for opposing democratisation is that the Islamists are likely to be the victors. But the uproar that has accompanied the Islamists’ gains is unhelpful; a calm and well-informed debate about the rise of political Islam is long overdue. First, we must define our terms. “Islamist” is used in the Muslim world to describe Muslims who participate in the public sphere, using Islam as a basis. It is understood that this participation is not at odds with democracy. In the west, however, the term routinely describes those who use violence as a means and an end – thus Jihadist Salafism, exemplified by al-Qaida, is called “Islamist” in the west, despite the fact that it rejects democratic political participation (Ayman al-Zawahiri, the leader of al-Qaida, criticised Hamas when it decided to take part in the elections for the Palestinian legislative council, and has repeatedly criticised the Muslim Brotherhood for opposing the use of violence). This disconnect in the understanding of the term in the west and in the Muslim world was often exploited by despotic Arab regimes to suppress Islamic movements with democratic political programmes. It is time we were clear. Reform-based Islamic movements, such as the Muslim Brotherhood, work within the political process. They learned a bitter lesson from their armed conflict in Syria against the regime of Hafez al-Assad in 1982, which cost the lives of more than 20,000 people and led to the incarceration or banishment of many thousands more. The Syrian experience convinced mainstream Islamic movements to avoid armed struggle and to observe “strategic patience” instead. Second, we must understand the history of the region. 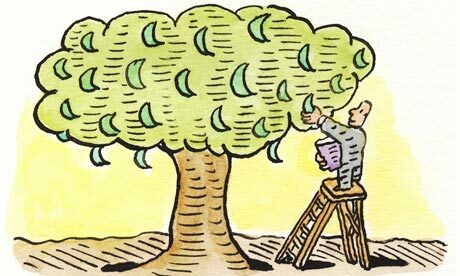 In western discourse Islamists are seen as newcomers to politics, gullible zealots who are motivated by a radical ideology and lack experience. In fact, they have played a major role in the Arab political scene since the 1920s. Islamic movements have often been in opposition, but since the 1940s they have participated in parliamentary elections, entered alliances with secular, nationalist and socialist groups, and participated in several governments – in Sudan, Jordan, Yemen and Algeria. They have also forged alliances with non-Islamic regimes, like the Nimeiri regime in Sudan in 1977. A number of other events have had an impact on the collective Muslim mind, and have led to the maturation of political Islam: the much-debated Islamic Revolution in Iran in 1979; the military coup in Sudan in 1989; the success of the Algerian Islamic Salvation Front in the 1991 elections and the army’s subsequent denial of its right to govern; the conquest of much of Afghan territory by the Taliban in 1996 leading to the establishment of its Islamic emirate; and the success in 2006 of Hamas in the Palestinian Legislative Council elections. The Hamas win was not recognised, nor was the national unity government formed. Instead, a siege was imposed on Gaza to suffocate the movement. Perhaps one of the most influential experiences has been that of the Justice and Development Party (AKP) in Turkey, which won the elections in 2002. It has been a source of inspiration for many Islamic movements. Although the AKP does not describe itself as Islamic, its 10 years of political experience have led to a model that many Islamists regard as successful. The model has three important characteristics: a general Islamic frame of reference; a multi-party democracy; and significant economic growth. These varied political experiences have had a profound impact on political Islam’s flexibility and capacity for political action, and on its philosophy, too. However, political Islam has also faced enormous pressures from dictatorial Arab regimes, pressures that became more intense after 9/11. Islamic institutions were suppressed. Islamic activists were imprisoned, tortured and killed. Such experiences gave rise to a profound bitterness. Given the history, it is only natural that we should hear overzealous slogans or intolerant threats from some activists. Some of those now at the forefront of election campaigns were only recently released from prison. It would not be fair to expect them to use the voice of professional diplomats. Despite this, the Islamic political discourse has generally been balanced. The Tunisian Islamic movement has set a good example. Although Ennahda suffered under Ben Ali’s regime, its leaders developed a tolerant discourse and managed to open up to moderate secular and leftist political groups. The movement’s leaders have reassured Tunisian citizens that it will not interfere in their personal lives and that it will respect their right to choose. The movement also presented a progressive model of women’s participation, with 42 female Ennahda members in the constitutional assembly. The Islamic movement’s approach to the west has also been balanced, despite the fact that western countries supported despotic Arab regimes. Islamists know the importance of international communication in an economically and politically interconnected world. Now there is a unique opportunity for the west: to demonstrate that it will no longer support despotic regimes by supporting instead the democratic process in the Arab world, by refusing to intervene in favour of one party against another and by accepting the results of the democratic process, even when it is not the result they would have chosen. Democracy is the only option for bringing stability, security and tolerance to the region, and it is the dearest thing to the hearts of Arabs, who will not forgive any attempts to derail it. The region has suffered a lot as a result of attempts to exclude Islamists and deny them a role in the public sphere. Undoubtedly, Islamists’ participation in governance will give rise to a number of challenges, both within the Islamic ranks and with regard to relations with other local and international forces. Islamists should be careful not to fall into the trap of feeling overconfident: they must accommodate other trends, even if it means making painful concessions. Our societies need political consensus, and the participation of all political groups, regardless of their electoral weight. It is this interplay between Islamists and others that will both guarantee the maturation of the Arab democratic transition and lead to an Arab political consensus and stability that has been missing for decades. In response to Pastor Terry Jones’ International Burn a Koran day, the Military Religious Freedom Foundation has decided to post the advertisement below in Jones’ city local newspapers. 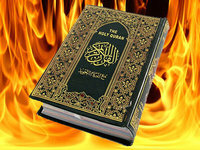 MRFF is acting because of concern members of the US military have expressed about the impact Jones’ book burning will have on the lives of military personnel posted in Muslim countries. It wasn’t but a few short years ago that any act considered endangering the lives of US servicemen was considered treasonous, but today racist elements in American society have managed to turn that notion on its head and instead say any act which doesn’t outrage Muslim sensitivities is appeasement, no matter how provocative the act may be or how it might endanger lives. MRFF’s response is the kind that will defeat the likes of Jones and the rest of the pilers on who’ve got on board with this xenophobic, Islamophobic notion of either denying Muslims their citizenship rights or provoking them. ‘Attaboy’ to MRFF! Those who try to make the word ‘terrorism’ a synonym of the word ‘Islam’ try to brainwash us these days by the phrase “I am a Muslim, I am against terrorism”, which many Arabic-language TV stations have started to use during the month of Ramadan, when TV viewing becomes a dominant pastime in the Arab world. This phrase is coined neither by Muslims nor by the real enemies of terrorism; and the objective of funding the intensive broadcasting of this phrase in Ramadan is not exonerating Islam of an accusation levelled against it by Zionists and their allies among the neo-cons in the wake of 9/11. This is clear from the political connotations of this phrase which suggest that “although I am a Muslim; yet, I am against terrorism”. In this sense, our enemies accuse a billion Muslims of terrorism; while Christians, Jews, Buddhists, Hindus and others are exonerated of any link with terrorism. One is entitled to ask: how many terrorist crimes the Zionists commit against Muslim and Christian Arabs in and outside Palestine, including murder, assassination, home demolition, setting mosques on fire, etc. Yet, have we ever seen a phrase saying “I am a Jew, I am against terrorism”? 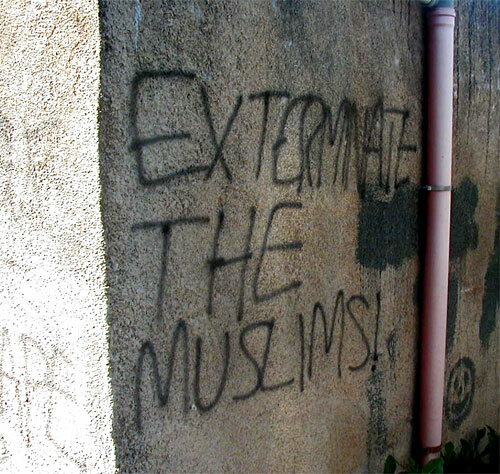 The fact is that the intensive racist campaign since 9/11, 2001 has targeted Islam and Muslims. If measuring events by their outcomes is the right way, it can be said that 9/11 aimed in principle at finding an excuse for waging a war on Muslims and covering up all the crimes committed by the Zionist and racist Israeli troops in Palestine, like Judaization, expulsion, killing, imprisoning, torture and displacement. One cannot but ask, are not 1.3 billion Muslims capable of facing this racist campaign through well-informed and open-minded research institutes capable of addressing the West in its own language and style and conveying to it the sublime message of Islam? If this message is spread and soundly implemented, it will be a genuine savior to humanity of all sins and tragedies which destroy spiritual peace and social cohesion. NetworkLet us remember how the word ‘terrorism’ was coined and how it was used by of the Apartheid regime to brand Nelson Mandela as terrorist; and how all resistance movements have been branded as terrorist by Fascists and Nazis until they triumphed and achieved freedom and independence for their nations. What we read today on Wikileaks shows that the United States exports terrorism to the world: “Wikileakes releases CIA paper on U.S. as ‘exporter of terrorism'” (Washington Post, 25 August 2010). Three papers described as ‘classified’ by the CIA’s red cell name the Pakistani David Headley and others to show that the U.S. government has become an exporter of terrorism. Headley acknowledged his responsibility for the Bombay attack which claimed the lives of 160 people. The paper adds that “Such exports are not new. In 1994, an American Jewish doctor, Baruch Goldstein, emigrated from New York to Israel, joined the extremist group Kach and killed 29 Palestinians praying at a mosque at the Tomb of the Patriarchs in Hebron”. It should be recalled that last month Wikileakes published 76,000 secret documents, part of American military files and field reports about the war in Afghanistan. The Pentagon asked for the documents to be withdrawn because they make the American troops and their Afghani agents liable to the charge of terrorism. This coincided with the scandal of Mohammed Zia Salehi, the chief of administration for the National Security Council about whom the New York Times published an article entitled “Key Karzai Aide in Corruption Inquiry Is Linked to C.I.A.” (25 August 2010). Reports confirm that Salehi was released upon Karzi’s intervention because he knows everything about corrupt deals inside the Karzi’s administration. An American official stated that it was common practice to deal with corrupt people in Afghanistan. He adds: “If we decide as a country that we’ll never deal with anyone in Afghanistan who might down the road — and certainly not at our behest — put his hand in the till, we can all come home right now,” the American official said. “If you want intelligence in a war zone, you’re not going to get it from Mother Teresa or Mary Poppins.” (New York Times, 25 August 2010). This is a clear acknowledgment of the absolute separation between morality and what American troops are doing in Afghanistan. In an article entitled “Making Afghanistan More Dangerous,” Jason Thomas asserts that American troops use mercenaries they call ‘security firms’ in protecting “foreigners, civil-society organizations and aid,” but also corruption money sent in cash in protected vehicles”. (The Herald Tribune, 25 August 2010). What do these people have to talk about Islam as a source of terrorism? And how could they accuse Muslims of terrorism, while thy themselves are major exporters of terrorism? Can those who use torture, assassination, corruption and wars as their declared method of occupying one Muslim country after another and killing millions of innocent Muslims accuse those who defend freedom, dignity and sovereignty of terrorism? The phrase which should be promoted on Arabic-language TV channels should be “I am a Muslim, I am a victim of terrorism”. As to our enemies, the stigma of terrorism, war, Judaization, settlement building, home demolishing, assassination and other crimes will haunt them throughout history, because they are the makers of terrorism regardless of their religion. Michael Enright, a 21-year-old college student, slashed a NYC cab driver in the face and neck because this man was Muslim. Enright is being held in a psychiatric ward. If he is mad, then the United States is also insane. Enright’s assault merely mirrors what we, as a nation, have done for nearly a decade. 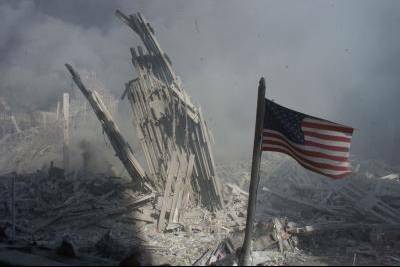 The United States has responded criminally and incoherently to what happened on September 11, 2001. Lopped of our twin members, downtown, we also lost our authoritative voice. Two days after that disaster, George Bush grimly declared, “The most important thing is for us to find Osama bin Laden. It is our number one priority and we will not rest until we find him.” Six months later, Bush shrugged, “I don’t know where bin Laden is. I have no idea and really don’t care. It’s not that important. It’s not our priority.” Our current president never mentions bin Laden, yet Obama has sent many more troops into Afghanistan. We’re not leaving any time soon, that’s for sure. Congress has just approved 1.3 billion dollars to expand our military bases there. Our new mission, if Time Magazine is to be believed, is to defend Afghan women against the Taliban, whom we created in the first place, to fight the Soviets. America gets a kick out of these flip flops. We propped up Saddam Hussein, then we had him hanged. We fought Communist Vietnam, then we staged a naval exercise with that same regime, as happened just recently, riling up China. Tension feeds the military industrial complex. Wars are even better. Responding to 9/11, America also invaded Iraq, a country that had nothing to do with that catastrophe. Since the real reasons for our two current conflicts, access to oil and natural gas, defense of the petrodollar, war profiteering, are never admitted to, many Americans have concluded that we’re simply waging war against Islam, which is, frankly, not that far off the mark considering our unequivocal support for Israel whenever it attacks Gaza, Lebanon, Syria or any other Muslim population. The U.S. has also been killing Pakistani civilians and threatening Iran. It’s a miracle many Muslims don’t hate us more. Without Israel and oil, it’s a safe bet we wouldn’t be demonizing Muslims so relentlessly. As is, this stoked hatred is bringing out the worst in our character. On Yahoo! News, many comments on the Enright story don’t condemn but applaud his obvious crime, and also bash Islam. Spreading like cancer across the internet, openly hateful and racist comments are especially common after stories about Muslims, blacks or Mexicans, the top three scapegoats at the moment. Obama is a lightning rod for anti-black racism, which is ironic because he does not favor blacks in any way. Like Bush, Clinton and the rest of our bank-bailing-out, paid-for politicians, Obama couldn’t care less about the little guys. Eyeing his own wallet and his future after the White House, Obama’s here to defend the moneyed interest. His blackness is merely symbolic, but that’s enough to enrage the racists. There’s no new order, lady. Obama himself is a head fake! Scratch that skin lightly, and you’ll see your beloved Dubya again. Everything is still in place, including the torture chambers. After another article in Alternative Right, a reader lamented, “After 9/11, we saw the lack of a white nation identity. There was abject surrender to Islam.” Only the most deluded can call the killing of hundreds of thousands of Muslims, and the occupation of two Islamic countries, an “abject surrender to Islam.” Although not all Americans think this way, of course, this man is hardly alone. 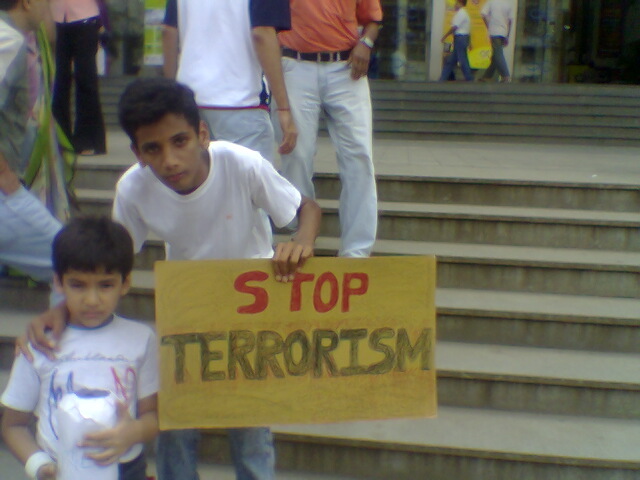 As the world’s biggest source of terror, we’re posing as its most helpless victims. The scapegoating of Muslims, blacks and Mexicans gives the appearance that we’re being threatened from without and below, when we’re actually being mugged from above, from the inside. It’s the entrenched who are killing us, not outsiders. Even with 9/11, too many questions remain. One must remember that Bin Laden began as a CIA asset, and two months before the attack, he was at the American hospital in Dubai, where a CIA agent visited him. On September 10, 2001, bin Laden was at the Army Hospital in Rawalpindi, Pakistan, to receive dialysis treatment. Again, no attempt was made to arrest him. Today, we’re also not trying to arrest this man, and that’s no conspiracy theory.